Hornorkesteret will be performing in the pavillion in the Church Park in downtown Fredrikstad on December 14th in celebration of the 100th anniversary of the conquest of The South Pole, www.nansenamundsen.no reports. In addition to the concert by Hornorkesteret, the celebration will contain live streaming audio from Antarctica with interactions from ambient musician Origami Antarktika, 17 sled dogs and sleds, free warm drinks, the animated short film “Fram og tilbake” about Roald Amundsen made at E6 Østfold Medieverksted with music by Hornorkesteret and the world premiere of Hornorkesterets epic song honouring Roald Amundsens achievements, “Roaldskvadet”. Also, the long awaited CD “Fjær og Jern” is released on this glorious day, and Hornorkesteret will perform several tracks from the album live. 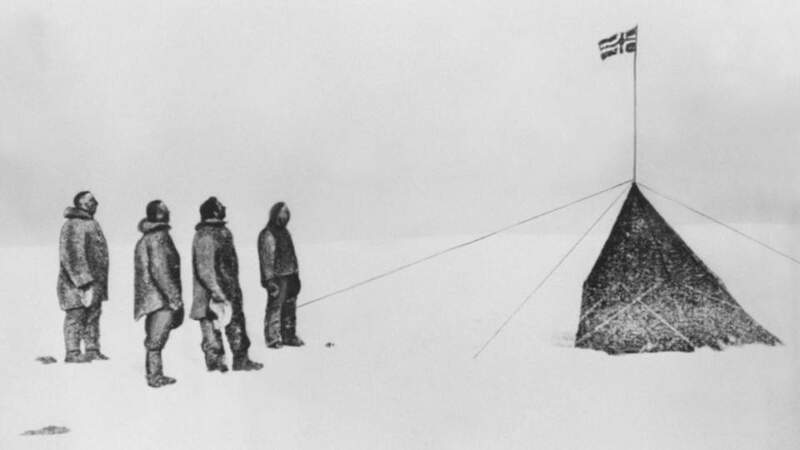 Born at Tomta in Borge just outside of Fredrikstad, Amundsen was the first man to reach both the South and the North Poles, and on December 14th 1911, he and his men planted the norwegian flag on the pole after a meticulously planned and executed operation. From his early days, he dreamt about becoming a polar explorer. Reading about the horrors Sir John Franklin and his men met while trying to navigate the North West Passage and reading about Fridtjof Nansen crossing Greenland on skis, inspired the young Amundsen to become a hero. Amundsen grew up in a shipping family and he had heard tales of faraway worlds since he was child. Nothing fascinated him more than ice and snow. He would sleep with his window open all year round to toughen himself to become a polar explorer. Later, he would be part of the first expedition to spend the winter in the Antarctic with the Belgica, navigate the North West Passage as the first man on earth in 1906, use dogsleds for the South Pole in 1911, become an aviation pioneer, almost perish with two planes in the arctic in 1925 and finally cross the whole polar ocean of the Arctic in the italian-built dirigible “Norge” in 1926. Amundsen disappeared in June 1928 on a rescue mission to save his by then bitter enemy, Umberto Nobile, who had crashlanded with his new dirigible, the Italia. Amundsens life is something to celebrate! Bring the kids -this is a fun family event. Wear something warm. The event is made in collaboration with Visit Fredrikstad and Kennel Nairebis.